Little Tokyo Business Improvement District. With the Little Tokyo area facing five years of Regional Connector construction, the Little Tokyo Business Association (LTBA) brought together community stakeholders and Metro representatives recently for a candid discussion about the area’s future. The community forum, held at St. Francis Xavier Japanese Catholic Center (Maryknoll) on June 17, set the stage for an exchange of information between Metro and the community about street closures, construction timetable, marketing, and locations, and business assistance was presented by Metro’s team of specialists. Olga Arroyo, construction relations manager, explained, “We are building almost two miles of light rail (and) building three new stations.” Those plans include new water lines and new sewer lines as well as pedestrian detours with crosswalks, and will require the widening of First Street and reduction of the sidewalks, Arroyo added. Expressing concern over the proposed street widening, James Okazaki urged Metro to reconsider the plan, pointing out that First Street had previously been widened. “The sidewalk is already narrow,” he said. 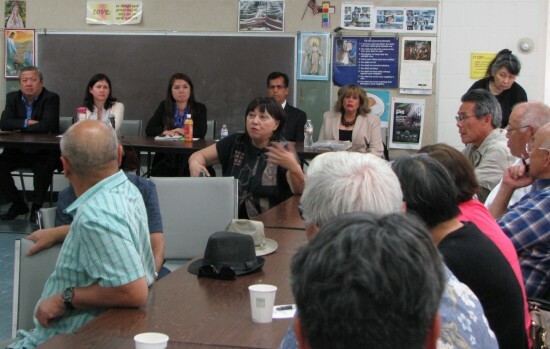 Arroyo, who serves as liaison between the community, Metro, and the construction contractor, encouraged those with questions or concerns to use Metro’s Regional Connector 24/7 hotline: (213) 922-7277. Angela Winston, vice president and program manager of Pacific Coast Regional, outlined the program that provides help to mom-and-pop business owners in the event Metro construction causes revenue loss. The online application process begins with a visit to the OCR’s website, www.pcrcorp.org. Click on the Metro icon. Winston noted that applicants will be contacted by a business advisor within two business days of submitting the application. Ron Fong of the Little Tokyo Service Center is overseeing business assistance services and can provide small businesses with information about construction timing and can help individuals determine whether they will be eligible for business interruption monies. Two programs designed to help Little Tokyo survive any potential negative impacts were announced at the meeting. Details of the first, Eat-Shop-Play Little Tokyo, an incentive program for businesses and customers, are being finalized and will be announced in the coming weeks, according to Metro’s Matthew Marquez. A different approach to marketing program was introduced by Midori Mizuhara, representing Community Arts Resources Services (CARS). She said that CARS has been asked to create customized branding for the area and will coordinate with local organizations to support events and activities that promote Little Tokyo.